MINNEAPOLIS — An interception of Vikings QB Teddy Bridgewater by Packers CB Micah Hyde helped set the Packers up for their second touchdown as they took a 14-10 lead into halftime on Sunday at TCF Bank Stadium. The Vikings tied the score at 7 with a 14-play, 74-yard TD drive that included two fourth-down conversions. On the first, Minnesota faced fourth-and-5 from the Green Bay 39 — after the Packers declined a penalty that would have made it third-and-15 — and S Morgan Burnett’s interception was wiped out by a defensive holding penalty on Hyde, giving the Vikings a first down. On the ensuing series, the Vikings faced fourth down again, this time needing just 1 yard from the Green Bay 25. RB Jerick McKinnon converted with a 3-yard run, and Bridgewater hit former Packers WR Charles Johnson for a 22-yard TD on the next play, tying the game with 11:06 left in the half. The Packers responded with two quick first downs to get the ball near midfield, but the drive stalled and Green Bay had to punt again. The defense got the ball back almost immediately, though, as Hyde leaped to intercept Bridgewater’s deep pass intended for WR Greg Jennings, another former Packer. The offense took over on its own 47 and wasted no time. A 16-yard run by RB Eddie Lacy was shortened to 6 yards on a downfield holding penalty on WR Jordy Nelson, but QB Aaron Rodgers then hit WR Randall Cobb for 12 yards and TE Andrew Quarless for 34 yards down to the 1. Rodgers then ran a play-action roll to his right and threw the ball all the way back across the field to his left, to a wide open TE Richard Rodgers, standing alone in the corner of the end zone. The Packers led 14-7 with 5:23 left in the half. The Vikings came back with a drive of their own, as Bridgewater converted a third-and-6 with an 11-yard pass to TE Kyle Rudolph and followed it up with a 10-yard slant to WR Cordarrelle Patterson and an 8-yard checkdown to McKinnon. That put the Vikings on the Green Bay 26-yard line at the two-minute warning. A facemask penalty on Vikings LT Matt Kalil pushed Minnesota back, but a 19-yard completion to Johnson got them back into field goal range at the 21. A high pass on third down for Johnson was nearly intercepted by CB Tramon Williams, and the Vikings settled for a 39-yard FG by Blair Walsh to make it 14-10 with 16 seconds left in the half. Vic, the first quarter was a game of field position that we ended up winning by scoring with a minute-and-a-half to go. Did you enjoy it? I liked it. With each exchange of possession, the Packers gained ground until they were in position to attack. I don’t think that kind of football is the Packers’ identity, but sometimes you have to do what the circumstances force you to do. The defense is playing well. Vic, how much of the stadium is in green and gold? Will Bridgewater get at least 130 passing yards today? He started slowly; he was wild high and long. He’s starting to warm up. Why punt the ball on fourth down with one yard to go? Why not just run the ball? Why not just run the ball on third down? How much do you think the chip-on-the-shoulder contributes to a player’s development and demeanor? I think it’s more of a story for the media and the fans about a guy beating the people who didn’t believe in him. How many guys with a chip on their shoulder got cut? It’s only a story when a guy makes it. This one has a little bit of an AFC North street fight feel to it. Remember, Mike Zimmer is an AFC North guy. My gut hasn’t stopped churning, yet. This should be a close game, like most figured. Like most figured? Most were looking forward to the Patriots game. I didn’t. I was most reserved and respectful. Vic, what is the story behind the Jaguars helmets? Were you still there when they went that way? Can you explain their thinking? I was gone by then. I would’ve never allowed that to happen. Why do all you talking heads tell us there’s no way the Packers lose vs. the crummy Vikings, when you know very well all NFL teams have the best players in the world? You’re so gullible. Don’t blame this talking head. I was warning everybody all week. Let’s all calm down. This one has a long way to go. Vic, how hard is it to win games like this against the Vikes when it’s late in the season and they are out of the playoff picture and are thus willing to take more risks, such as going for it repeatedly on fourth down? Blame it on being out of playoff contention? Tough game today. You were right about them Vikes. I could see it as I looked at them through the week. Are a lot Packers fans blasting your inbox because it isn’t 28-0? The sea is angry, my friend. I remember last year a coach changed his mind and took a penalty once we were going to go for it on fourth down. Could Mike have changed his mind once the Vikings tried to go for it on the fourth-and-5? I think it was the Cincinnati game. There was a time out at the time, I believe. Let’s revisit this question tomorrow when I’m back at the office and can open my rulebook. MINNEAPOLIS — The Packers held a 7-0 lead over the Vikings, following one quarter of play at TCF Bank Stadium on Sunday. With 4:44 to play in the quarter, the Packers took possession at their 46-yard line following a Vikings punt. On third-and-10, Aaron Rodgers hit Randall Cobb over the middle for 29 yards to the Vikings 25. It was the first time in the game either team had crossed midfield. A pass to tight end Andrew Quarless gained 16 to the 7. On first-and-goal, Rodgers threw for Jordy Nelson and the Vikings were flagged for pass interference, moving the ball to the 1. 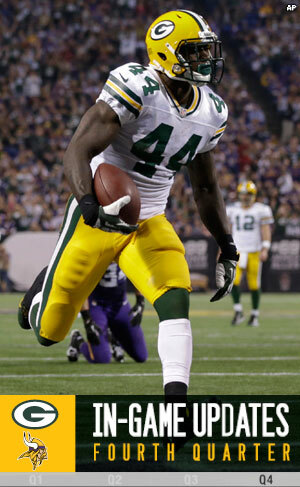 Eddie Lacy plunged for the touchdown on the next play, and the Packers led, 7-0, with 1:34 to play in the quarter. The Vikings won the coin toss and elected to defer their choice. As per team tradition, the Packers select game captains each week. Today’s captains will be G Josh Sitton (offense), DT Letroy Guion (defense) and LB Brad Jones (special teams). Packers CB Davon House (illness) has been added to the injury report and is PROBABLE for Sunday’s game against the Vikings. MINNEAPOLIS–The Packers improved their record to 5-2 and maintained their hold on first place in the NFC North with a 44-31 win over the Vikings on Sunday night. Leading 31-17 after three quarters, James Starks roared 25 yards up the middle on the second play of the fourth quarter, and the rout was on. The Packers defense then pitched a three-and-out at the Vikings, and Aaron Rodgers erased any lingering doubt. He completed a 27-yard strike to Jarrett Boykin in a drive that began emptying the seats at the Metrodome, which was hosting its final Packers-Vikings game. The Packers eventually settled for a 20-yard field goal by Mason Crosby that gave the visitors a 41-17 lead with 6:10 to play. Minnesota scored a touchdown with 4:42 to play and then unsuccessfully attempted an onside kick on the ensuing kickoff, leaving the Packers to kill the remaining time and turn their thoughts to next week’s game against the visiting Chicago Bears. Crosby tacked on a 45-yard field goal with 2:53 to play. Vikings quarterback Christian Ponder scored on a 19-yard run to cut the Packers’ lead to 44-31 with 1:24 to play. The Packers recovered the onside kick. Rodgers threw for 285 yards, two touchdowns and a 130.6 passer rating. Lacy led all rushers with 94 yards. The Packers held Adrian Peterson to 60 yards rushing. MINNEAPOLIS–The Packers increased their lead to 31-17 through three quarters of action at the Metrodome on Sunday night. The Packers struck first in the second half on an 80-yard, ball-control drive that combined the power running of Eddie Lacy and the precision passing and timely scrambling of Aaron Rodgers. The key play in the drive was a 14-yard scramble by Rodgers on a third-and-2 from the Vikings 26-yard line. On first down from the 12, Lacy ran over defenders and down to the 5-yard line, which gave Lacy 45 yards rushing to that point in the drive. On third-and-2 from the 4-yard line, Rodgers scrambled to the 1-yard line. A player later, Lacy scored over right tackle. The Packers defense asserted itself on the Vikings’ next possession. A Mike Daniels sack forced a punt and the Packers offense, which was playing near-flawless football, took possession at its 26-yard line. James Starks replaced Lacy but the gashing runs continued. Starks rushed for two first downs on consecutive runs. Rodgers completed a sideline pass to Myles White, who made a defender miss and roared down the sideline to the Vikings 24-yard line. That’s where the third quarter ended. You called it, Vic, on Cordarelle Patterson. This will be a good game. All I wrote is that he’s a big-play guy that gives me much more concern than Greg Jennings does. Patterson was very nearly the Packers’ first-round pick last spring. Vic, even though the Vikings are a one-win team, it seems they are one player away from being a really good team. What say you? I agree, but that one player is the most important player of all and the most difficult player to find, the quarterback. If Christian Ponder was to come of age, the Vikings could make a second-half-of-the-season run for the playoffs. There are a lot of teams with losing records in the NFC. The No. 6 seed is wide open. The Giants are a team I believe can come to life. The season is still young. Vic, how about the crowd? How much green is in there? The Packers have a lot of fans here tonight, and they are loud. I would put the crowd at 60-40, Vikings fans. Jordy has some of the best hands I’ve ever seen. I have no idea how he catches some of those passes. Have you ever covered a receiver as sure-handed? Sam, I’ve covered some very good receivers, beginning with Lynn Swann and John Stallworth. Jordy Nelson is an outstanding receiver. On the 11-yard touchdown catch Nelson made, Aaron Rodgers’ pass was jaw-dropping. He fit it into the tightest of windows and he zipped it past Josh Robinson’s head before Robinson was able to turn and see the ball. On the 76-yarder, the window was just as tight. Those were two incredibly skilled passes by Rodgers. Do you understand where I’m going with this? In the second quarter, Adrian Peterson lowered his head right into Tramon Williams’ head. Is that not a perfect example of the the new rule that should have been called? It probably is, but it’s a rule I don’t like and it doesn’t offend me that I have yet to see it enforced. I’m all for player safety, but I don’t want to see aggressiveness eliminated from the game. Initiating contact is a trrademark of great backs. 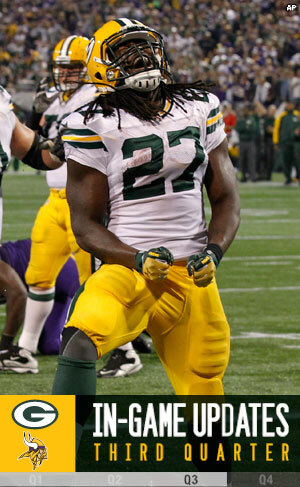 That’s just my opinion, and it would be the same if Eddie Lacy dropped his head on a Vikings cornerback. 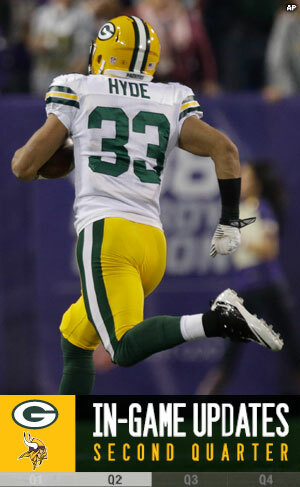 With so many teams going to solid-color uniforms, like the Vikings going all purple on Sunday night, will we see the Packers wear solid-green uniforms? I hope not. I think the Vikings’ uniforms are awful looking. I don’t know why they ever changed their uniform style. I always liked their uniforms. These look like clown suits. What do you think about how the Packers defense is doing in the first half? The pass interference penalty on Tramon Williams was an awful call. Until that play, the defense was playing outstanding football. This is a defense on the rise. When Clay Matthews and Nick Perry return to action, I think this defense could become special. Vic, what was going through your mind when you saw the opening play? I thought to myself, the Packers should’ve kicked it farther. I think most people remember how it bothered me that the Vikings maneuvered to get back into the first round and draft Patterson. He’s a guy with huge upside. He can be their next Randy Moss. How about Micah Hyde, huh? Randall Cobb might’ve just become a full-time receiver. The Packers are growing. Their roster is getting deeper and more talented. That’s what development does for good young players, and Hyde is one of them. By the time Cobb and Matthews return to action, look out.